Power2Peer is currently engaged in an equity crowdfunding campaign with StartEngine. Here are some answers to questions we have received from investors and others interested in joining the green energy revolution! Join the microgrid revolution by investing today! Q. When did you launch this initiative and why? The Power2Peer initiative was launched in January of 2018 in response to the broad failures of grid-based power distribution, which cause major disruptions in electrical power supply. With clear data indicating glacial and permafrost melting caused by global warming, Power2Peer was founded to provide a green alternative that reduces carbon emissions while also providing a return on investment and backup grid power communities can depend on in emergencies. Additionally, in places where grid access is limited, such as India and many African nations, microgrids offer communities a better quality of life by tapping the readily accessible power of the sun. Power2Peer’s vision is to provide a solar-powered alternative to the main electrical grid. By facilitating the distribution of locally generated power gathered by microgrids of connected solar panels, we will decrease dependence on the centralized grid operated by large corporations. By opting for Power2Peer – the adaptive solar microgrid system with blockchain-enabled peer-to-peer trading – people will be empowered to trade energy within local markets and source electricity through a decentralized network of microgrids. This will allow them to access power that is there when they need it, even when the utility grid goes down during a storm. Consumers will pay less for electricity, while producers and prosumers will earn revenue by selling surplus energy to their community. Q. How will this initiative work? Power2Peer’s innovative technology and business model will decentralize the delivery of electrical power. Power2Peer will democratize energy by empowering communities to take control over where they get their energy and how they use it. No longer will people be so dependent on a centralized grid operated by utilities and supplied by carbon-intensive generation. Power2Peer proposes to create adaptive solar microgrid systems with blockchain-enabled peer-to-peer trading. The power source is highly efficient solar PV. Energy storage can be added to store solar energy for later use, further enhancing efficiency. People will be able to trade energy in local markets and get power through a network of microgrids; a decentralized power grid. The initiative will be crowdfunded initially under the regulation crowdfunding approved by the SEC. We plan to raise significant capital through strategic investors in the power industry. You can learn more about our equity crowdfunding campaign and invest at startengine.com/power2peer . With Power2Peer’s program, power will be available when needed, even when the utility grid goes down. By opting for solar power, people contribute to a cleaner environment by lowering their carbon footprint. Locally produced solar power has a low marginal cost – sunlight is free – so consumers will pay less than they would for grid power. By adding energy storage to the mix, stored solar power can be traded and used when the sun is not shining. This is not to say that traditional utility companies will be absent from the future. Microgrids will be connected to the centralized grid. Utilities will benefit from a system that makes the most efficient use of all energy resources. When there is a major outage on the grid, microgrids can operate independently, leaving fewer people in the dark, and freeing up utility resources to better serve customers without power. Microgrids have also been shown to help utilities avoid large investments in infrastructure. An example of a “non-wires alternative” is the Brooklyn Queens Demand Management Program. Instead of investing $1.2 billion to upgrade a substation to meet increased demand, incentives of $200 million were given to customers and the utility to reduce demand for grid power. Utilities’ bottom lines benefit from microgrids helping keep the grid balanced. The adaptive solar microgrid system will create local wealth. Today, homeowners using solar panels are producing their own electricity, and many do not use all of what they produce. Such homeowners would be able to generate income by providing surplus power to others in their community. In turn, the extra income from this sale of excess power, together with the money homeowners (both those producing and those buying from the producers) will save by paying less for the energy they consume, will drive more solar investment. With more viable systems of renewable energy distribution, green energy can attract those involved in real estate, such as large scale commercial developers. Jobs will be created, as local workers will be needed to build, operate, and maintain microgrids. All of this will serve to lift local economies. By creating a blockchain framework for transacting energy in the local microgrid environment, Power2Peer will boost the local economy and support the growth of local community. Investing in Power2Peer is an opportunity to participate in valuable innovation in its early stages, and to support decentralized peer-to-peer markets as they continue to grow and evolve. Q. Do you plan to connect people within the grid with your own cables or you are going to lease existing network from electric companies? We plan to piggyback on the grid for now. We want to work along with them as they have the monopoly and we are the disruption. We will start becoming backup for the main grids. Q. I am guessing the cost of building the grids must be quite high. Who covers that? The customer who is interested in having panels, the company, investors? Q. Is it a non-profit or for profit? Power2Peer is a for-profit venture. 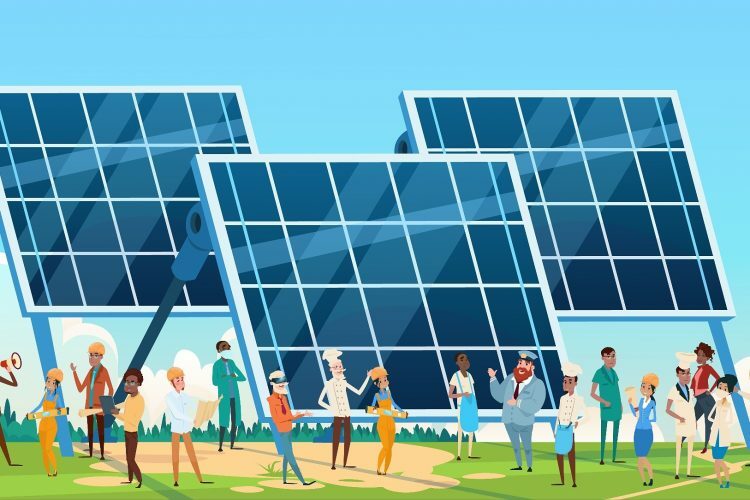 The proliferation of solar microgrids will boost local economies through the trading of power across connected microgrids, while significantly reducing carbon emissions. Q. How do investors get a return on their money? Do you plan to pay them a percent of revenue or dividends? Investors would see dividends from acquisition or IPO. We are also looking into the secondary power token market; we hope to be power producers. Q. On your timeline on the website it seems that you are in the process of creating your own token linked to the microgrids. How is that going? We have created a test network for token transaction. We are looking into security tokens. Q. Do you plan to distribute any of the blockchain tokens to investors? Yes, we are planning on this and looking into it. We must remain SEC compliant, and we are currently using StartEngine for a crowdfunding equity sale. Q. Do you plan to use any of the grids for cryptocurrency mining? Miners are potential clients, as are other businesses that consume a lot of power. Once we build our network of microgrids, we will become power producers. Q. Does the company the own the software you are developing, or which legal entity has the rights to the code? Power2Peer owns the software and the rights to the code. Q. You say that the MVP is going to be done in Q2 2019. Can you explain the action items that remain? The components of the MVP have been completed at lab-scale. We are now moving to complete the demonstration project at the Burlington, MA, where all the components of the MVP will be demonstrated in action. Q. You talk about PSC; where can I find more information about its development? Photonic Solar Conversion (PSCTM) is a patent pending technology shifts the light spectrum of solar energy to maximize the generation of electrons by solar cells. The PSC coating when applied to the solar glass is able to shift UV and visible part of the spectrum closer to the bandgap of the solar cells where the external quantum efficiency is highest for the absorption of the photons to generate electrons. You can read the technical brief on quantum efficiency and PSC here.